Massive herds of zebra roam the open grasslands of the Serengeti. Two species of this iconic, horselike equid live throughout southeastern Africa. Burchell's zebra, also called the plains zebra, is the most widespread. The larger Grevy's zebra lives primarily in northern Kenya. A third zebra species, commonly called the mountain zebra, resides in south and southwestern Africa. All three species, as large herbivores, play similar roles in their respective habitats. Zebras need a constant water supply, and the herds migrate following seasonal rains. As they move, they eat stems and old growth. Zebras survive on a diet of rough vegetation with relatively low nutritional value, which their hindgut fermentation process allows them to digest. Because they cut back old growth and consume lower quality plant matter, they increase the overall quality of vegetation in areas where they travel. Zebras play a critical role for other herbivores by clearing the way for growth of tender new leaves and grasses. Other herds, including wildebeests and gazelles, follow behind the zebras grazing on the new shoots that grow in their wake. Many African carnivores prey on zebras, with lions and hyenas responsible for 85 percent of large herbivore predation. Of zebras that die on the Serengeti plain, 30 percent of them are killed by lions and hyenas. These carnivores act to limit zebra populations, which would otherwise overwhelm the food resources of the region. To a lesser extent, wild dogs, leopards and cheetahs also prey on zebras. Because zebras must consume substantial amounts of water, Nile crocodiles sometimes also attack them while they are drinking. Zebras don't necessarily have a direct relationship with insects, but many insects eat the same plant matter zebras do. If large herbivores are removed from an area, vegetation accumulates and insect populations increase, which can cause problems for farmers in the area. Insect predators such as reptiles also increase where insects proliferate. On the savanna, large herbivores such as zebras and elephants play a critical environmental role by keeping insects that could potentially be pests at bay. Large zebra herds inhabit the Serengeti plains, and neither Burchelli's nor Grevy's zebras are endangered species. However, illegal hunting and habitat loss threaten the ungulates. Particularly during droughts and dry seasons, zebras compete with domestic livestock for water resources. 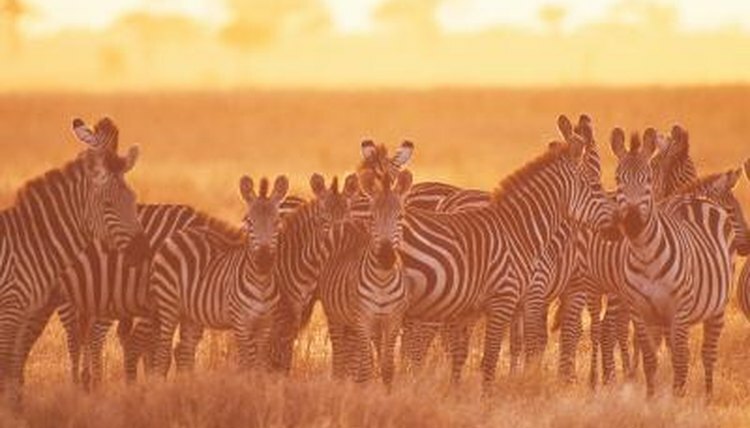 The presence of zebras often leads farmers and ranchers to fence their property, which restricts zebras' grazing lands and blocks their migratory routes. In addition to destroying their habitat, people also poach zebras for their meat and their desirable striped skins.